Sunshine. Lollipops and…. (I’m singing this, I don’t know why) but it just kind of sums up the #earlsfieldliving adventures of the weekend… I won’t harp on. I just want to give a quick low down on the Belle Amie experience yesterday as part of the intro into the CoffeeMania challenge I am doing (blog to follow in a couple of weeks). Anyway, Belle Amie has a gorgeous set up, so quaint but cozy and has a lovely choice of cakes and foodie stuff. With the weather being so glorious we had walked up the high street and after deliberations (here?,here?,here?) we went for Belle Amie (I haven’t had a coffee here yet anyway, so made perfect sense). We sat outside to bask ourselves and ordered some lunch and treats! 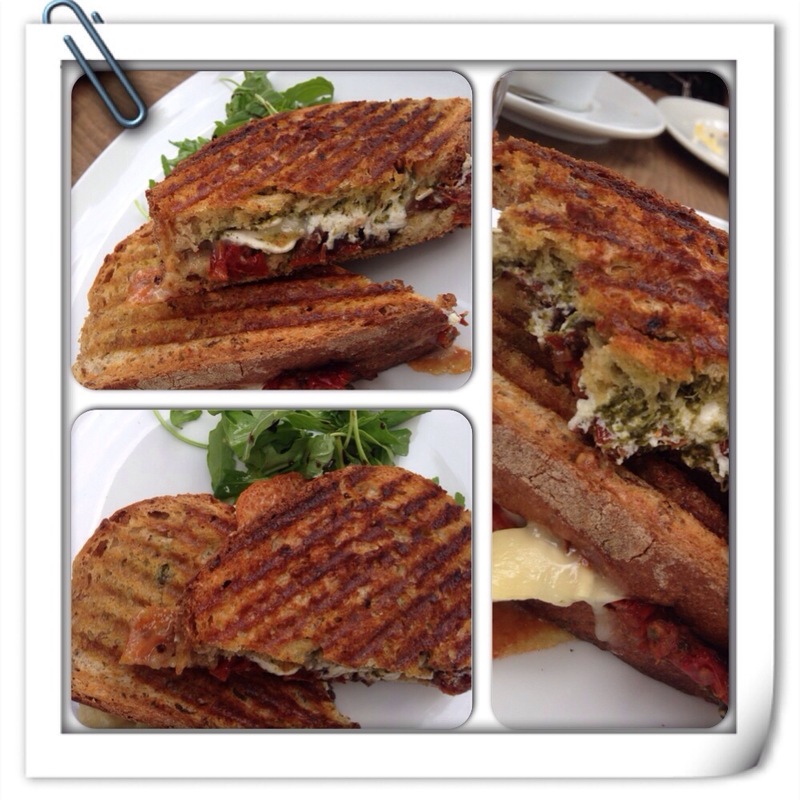 I opted for the Vege Stack grilled sandwich (£5.50) which was a delightful combination of goats cheese, pesto, sun blushed tomatoes and caramelized onions… Can you taste it? It sounds delish- I can confirm it was delish. (Yum, yum, yummy). I also got an americano (£2.20) and it was so nice. It’s definitely going to be a strong contender in the CoffeeMania challenge. Overall the experience was loverlyyyy! Everyone seemed relaxed and friendly. The food was of high quality and the treats section, although tempting I stayed away looked mouth watering. My housemate grabbed the blueberry muffin along with her coffee and she seemed to enjoy – “fabulous” was her choice of word. I’ll definitely be bringing friends along to this establishment when they visit to indulge in the sweet tooth options. I have my eye on their carrot cake. To conclude, Une belle expérience à Belle Amie.